We are getting a lot of reports coming in of the upgrade (!) to iOS9.3 failing, see screen shot attached. 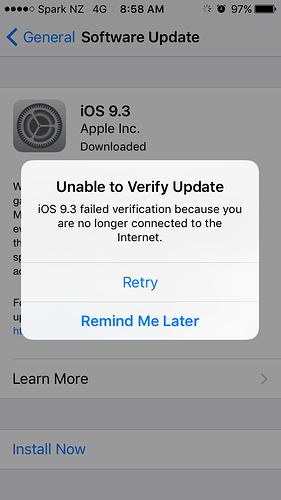 It appears that this is not a new problem, a quick google search shows forums reporting this error for iOS7.x, basically it says wait for the update to update. Other threads take you through flushing the device memory, toggling on and off the WiFi etc but the explanation from ComputerWorld appears the most sensible. connected to the Internet when in truth they were. Cupertino, Calif. company re-released iOS 9.3.
staffer – were connected to the Internet. on Apple’s support forum spelled out the problem, and the likely cause. than 10,000 times, a very large number for such a small collection of reports. and were directed to Apple’s support forum.